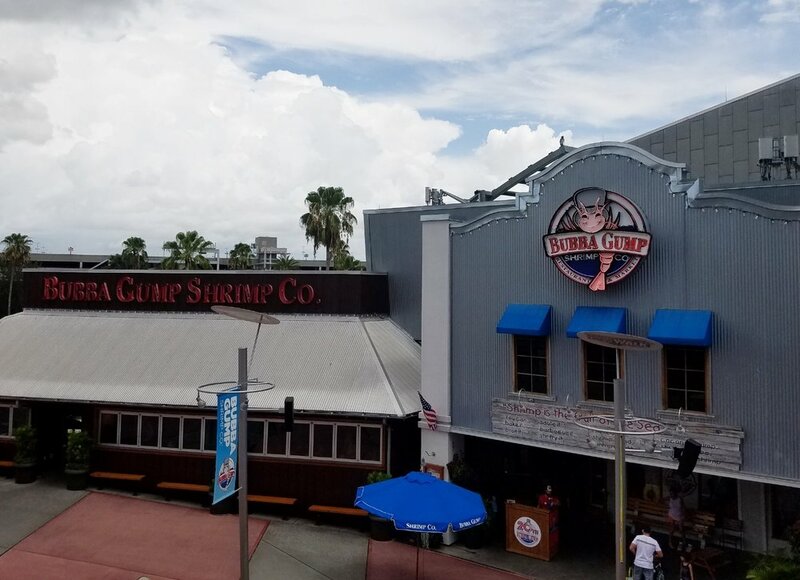 Bubba Gump Shrimp Co. is located right at the entrance of Universal CityWalk Orlando (when you are coming from the Universal parking garage or the bus and taxi drop-off area). Bubba Gump Shrimp Co. is a chain seafood restaurant inspired by the Forrest Gump movie. The Orlando location in CityWalk features a restaurant and a market. The restaurant has movie themed dishes like Mama Blue's Shrimp Gumbo and Jenny's Catch of the Day. The market sells Gump themed merchandise and souvenirs. 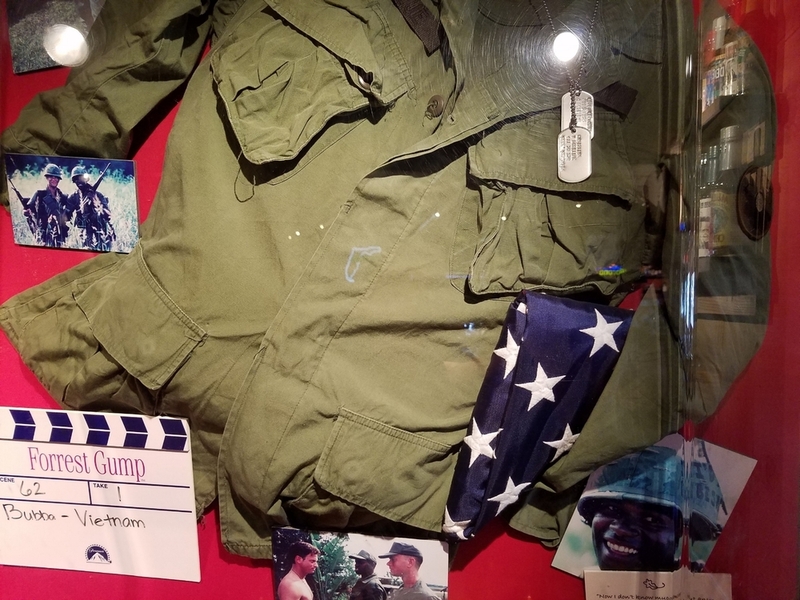 If you're a Forrest Gump fan, you'll love the décor, which includes lots of movie memorabilia. The servers also get in on the fun by challenging diners with movie trivia (they know a lot about Forrest, so get ready to be stumped). You can call your server over to your table any time with a nifty sign that says Stop Forrest Stop. One of the seating areas in Bubba Gump Shrimp Co.
Forrest Gump themed booth at Bubba Gump Shrimp Co. Dining at Bubba Gump Shrimp Co.
Bubba Gump Shrimp Co. specializes in seafood. You can order plenty of shrimp dishes along with fish and crab legs. If you don't like seafood, you'll find other fare like burgers, chicken, steak, and ribs on the menu. The prices on entrees range from about $10 all the way up to $30. After dinner, you can indulge in one or more desserts, including Mama's Best Strawberry Shortcake and Mamas Bread Pudding. Bubba Gump Shrimp Co. also has a gluten free menu with a few different menu choices, including salads and a shrimp cocktail appetizer as well as entrees like a salmon and veggie skillet and shrimp and veggie skewers. The Bubba Gump kids menu has meal deals that come with an entrée, side, drink, and Jello. Child-sized entrée options include fish sticks, popcorn shrimp, ribs, chicken strips, cheeseburgers, pizza, mini corn dogs, and grilled cheese. Kids meals cost about $9. 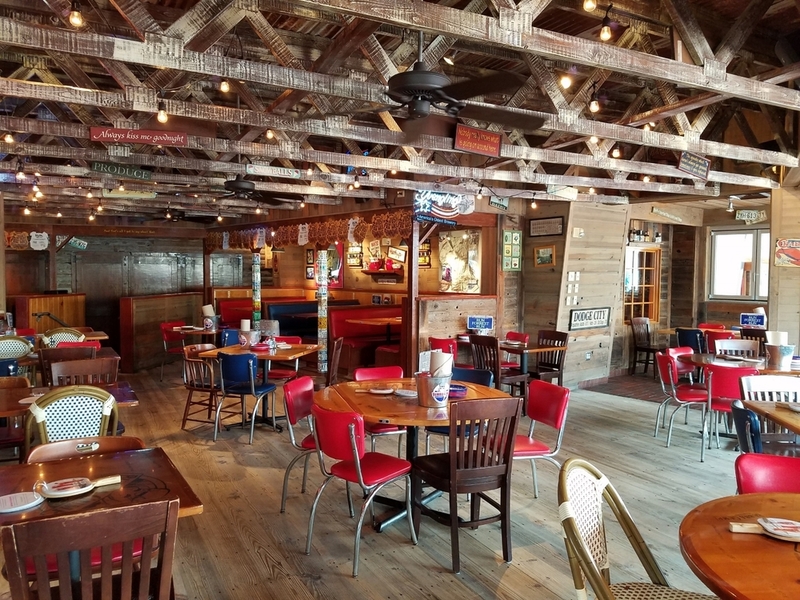 For a seafood restaurant, Bubba Gump Shrimp Co. has quite a few drinks. You can get hand-shaken margaritas, mojitos, hard lemonades, and spiked punches and iced teas. Non-alcoholic drinks include frozen slushy drinks, speckled lemonades, and smoothies. Some of the drinks from both menus are served in souvenir glasses. Bubba Gump Shrimp Co. is also one of the few places in Universal Orlando where you can get Pepsi products. All-American Burgers & Fries: $11.49 Make it a Cheeseburger for $1.00 more. Make it a BBQ Burger topped with Frizzled Onions for $2.00 more. All kid's meals are $8.49 and come with one entree, one side, jello, and a drink. 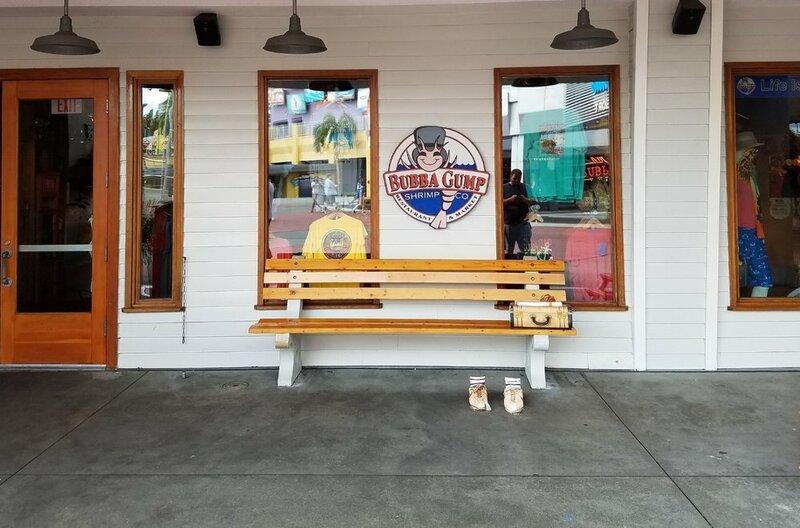 The Bubba Gump Shrimp Co. retail shop sells apparel, hats, drinkware, and Forrest Gump DVDs and CDs. You can also find a selection of food, including some of mama's sauces and boxes of chocolate. To get an idea of the type of merchandise you can find in the Orlando retail location, check out the Bubba Gump Shop online. 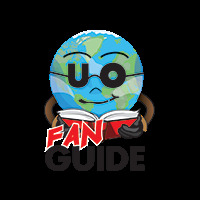 This online shop is also a good place to get Bubba Gump Shrimp Co. gift cards before you go. Getting Discounts at Bubba Gump Shrimp Co. 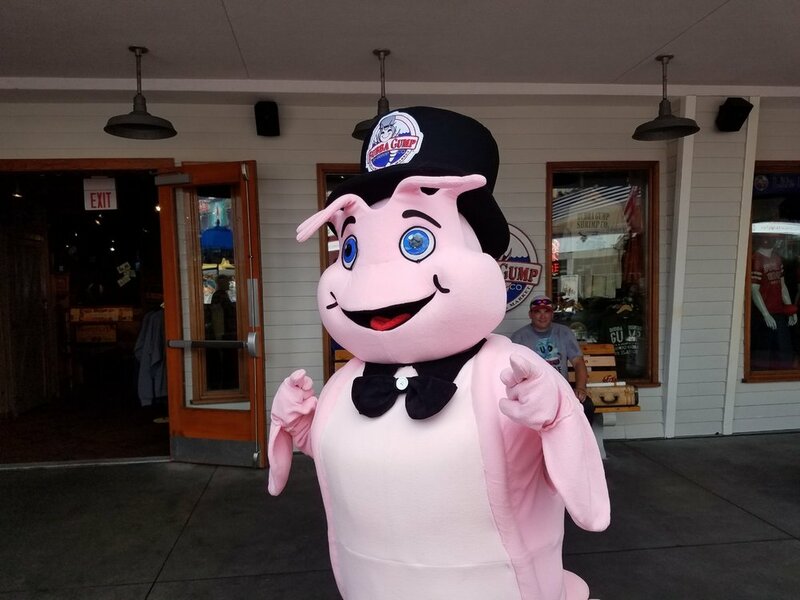 Preferred Pass holders can save 10 percent on meals and merchandise at the Bubba Gump Shrimp Co. Restaurant and Market by showing their annual pass. Premier Pass holders save 15 percent. Look for the bus stop bench from the Forrest Gump movie in front of the restaurant to take advantage of a great photo opp. The Forrest Gump photo op outside of Bubba Gump Shrimp Co. 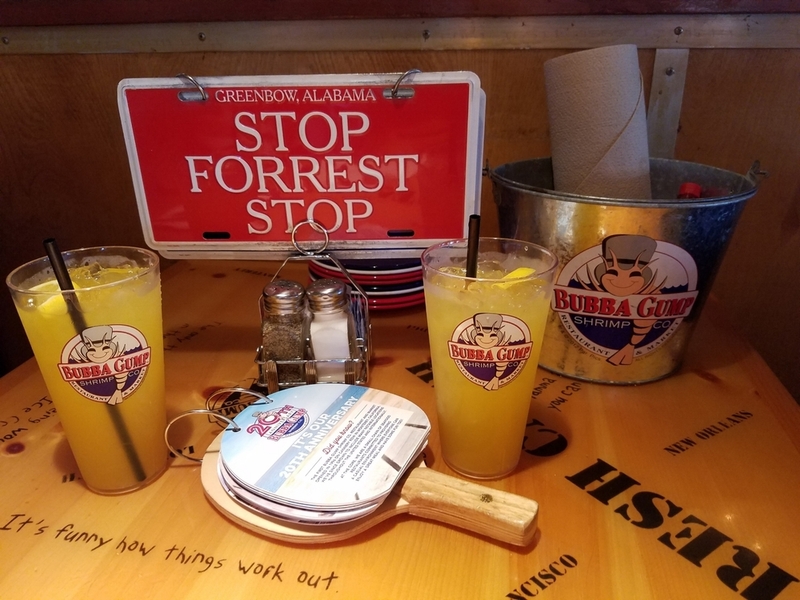 Example of some of the props and references to the Forrest Gump movie in Bubba Gump Shrimp Co.
Review of Bubba Gump Shrimp Co.
Bubba Gump Shrimp Co. is a good place to eat even if you aren't crazy about the Forrest Gump movie. The restaurant has a large menu and the widest selection of fish and shrimp dishes on Universal Orlando property. Prices are on par with most of the other table service restaurants in CityWalk. If you do like Forrest Gump, this place is a can't miss. You'll find movie references at every table and on every wall in the restaurant. We highly recommend walking around a little after you have ordered your food so that you can really take it all in. The dining area is very large and is split into a series of smaller rooms, which means there is a new Forrest Gump discovery around every corner. 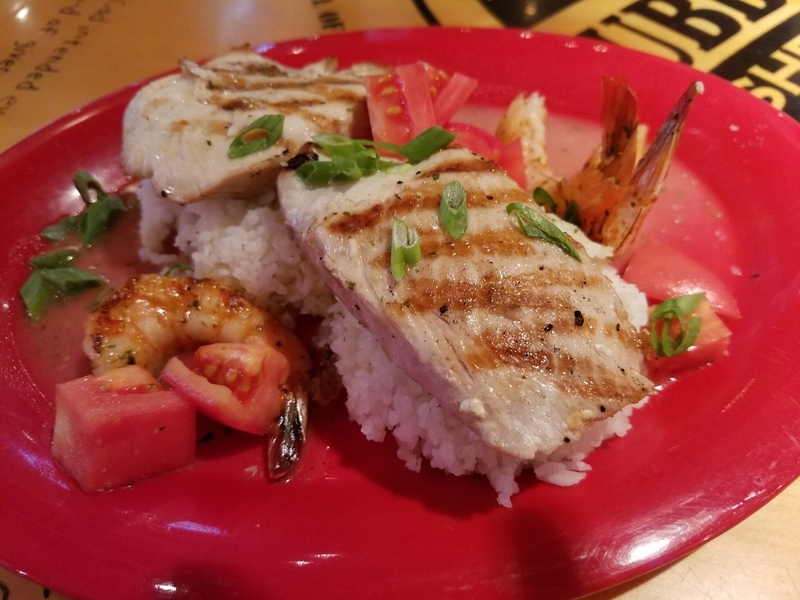 Accidental Fish and Shrimp: This dish consists of broiled Mahi Mahi with grilled shrimp, roma tomatoes, and lemon butter sauce. The fish was light and flaky. The tomatoes were fresh. The shrimp was nicely seasoned and tasted really good in the lemon butter sauce. We would probably get this again. 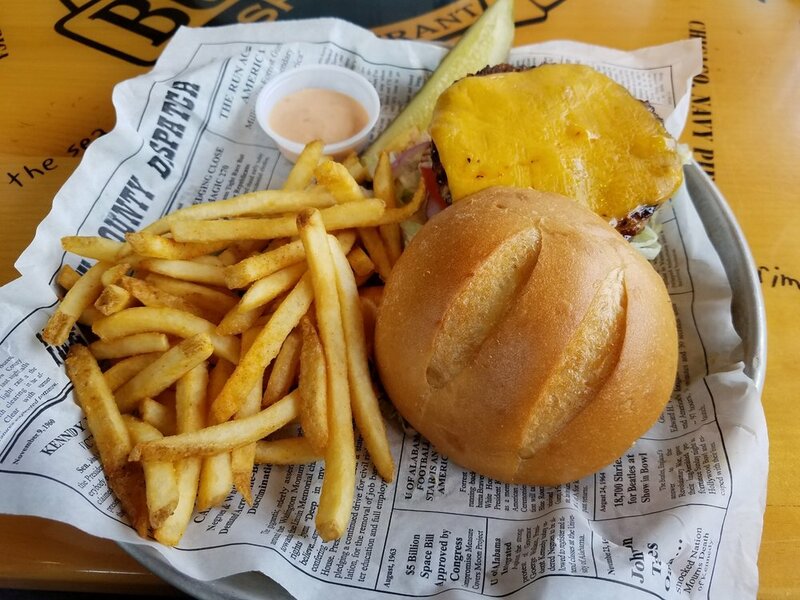 All American Burger: This 1/2 pound burger can be customized with add-ons like cheese, BBQ sauce, and frizzled onions. For a $1 more, you have the option of getting a patty made of grass-fed Angus beef from 44 farms. 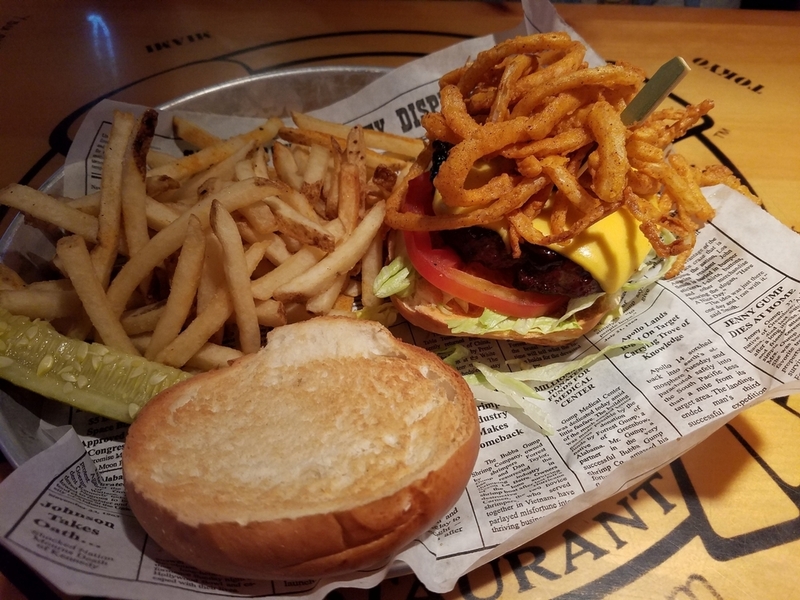 We have gotten two different versions of this burger and it tasted good both times. We would definitely get this again. 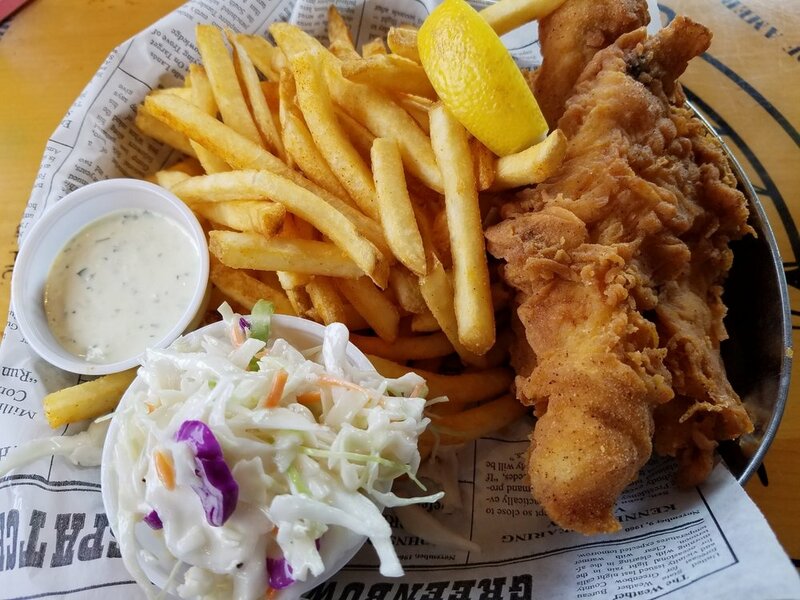 Captain's Fish and Chips: This dish is on the Forrest's Favorites menu. It consists of beer-battered cod, French fries, coleslaw, and homemade tartar sauce. You get three large pieces of fish. For an extra $5.00, you can get an even bigger portion of fish, which would make this dish easily shareable. The batter was crisp, nicely seasoned, and really tasty. The coleslaw was also really good. We would definitely get this again. Hook, Line and Sinker: This is a best of the best dessert sampler platter featuring Mama's Warm Bread Pudding, Homemade Biscuits Topped with Fresh Strawberries, and a Chocolate Chip Cookie Sundae. This dessert platter was absolutely divine and contained enough treats to share between two or more people. We would definitely get this again. 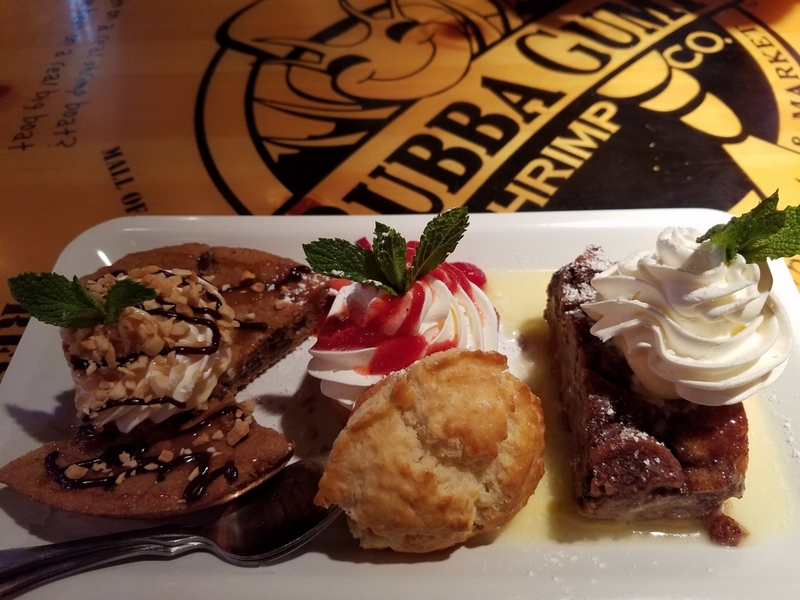 If you don't go in to Bubba Gump Shrimp Co. for a meal, think about stopping in just for the decor and the Hook Line, and Sinker dessert platter. The service has been good both times we visited Bubba Gump Shrimp Co. Our food also came out fast and hot both times. Accidental Fish and Shrimp with Roma Tomatoes, and Lemon Butter Sauce from Bubba Gump Shrimp Co.
All American Cheeseburger with Frizzled Onions, BBQ Sauce, and Fries from Bubba Gump Shrimp Co.
Captain's Fish and Chips with Fries and Coleslaw from Bubba Gump Shrimp Co.
Hook, Line and Sinker Dessert Sampler from Bubba Gump Shrimp Co.
See pictures of the Bubba Gump Shrimp Co. restaurant, food, and merchandise in this image gallery. Movie Prop Decoration at Bubba Gump Shrimp Co. Plenty of Seating at Bubba Gump Shrimp Co. Tables for Larger Groups of Visitors at Bubba Gump Shrimp Co.
Movie Prop Decorations at Bubba Gump Shrimp Co.
Forrest Gump Movie Props at Bubba Gump Shrimp Co.
Map Bubba Gump Shrimp Co.
Bubba Gump Shrimp Co. is represented by the number 05 on this CityWalk map. Look for the number 05 to locate Bubba Gump Shrimp Co. on this map.